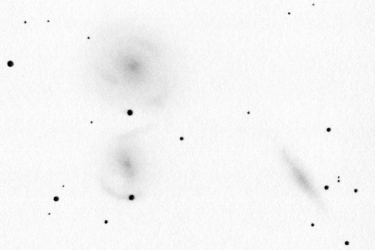 NGC 7393 (Arp 15) drawing inverted into positive. Made using a 16" Newtonian telescope. NGC 7393 is a tiny but relatively bright ring-like spiral galaxy in Aquarius. The inner part (the ring) is about 50"x25" in apparent size. 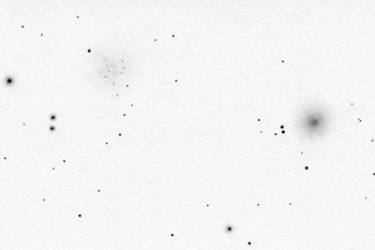 The galaxy doesn't seem to be faint in the telescope at all (12.6m) but it is a very difficult sight. The whole surface is lacking contrast. It is very difficult to interpret the details. Even the core region isn't obvious. 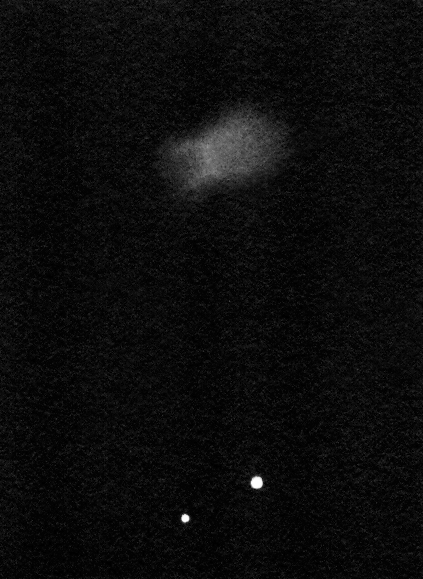 It is only a small elongated faint spot. 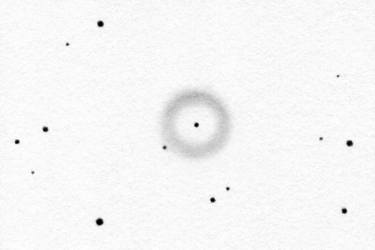 The ring was not visible but some sections could be detected. The threads starting around the core region conld be seen but they didn't seem to form a ring. I could detect (?) the east one (to the right; the bigger one) of the holes that are visible on both sides of the nucleus in the photos. And the asymmetry of the system was visible as well. It was interesting to draw this galaxy. I was completely in doubt while trying to figure out the details - I didn't remember the photo at all. 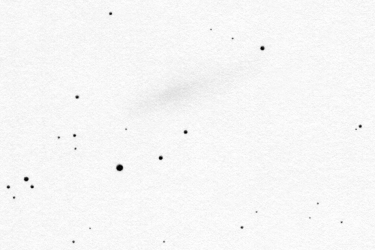 NGC 7393 made it into Halton Arp's atlas of peculiar galaxies as well as Arp 15. 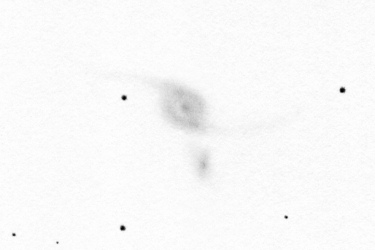 Not only because of the asymmetric ring but because of a sort-of separate piece of a spiral arm (a "detached segment") in the faint outskirts of the galaxy. 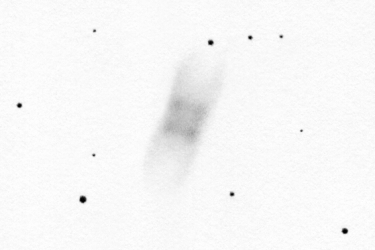 This outer section is much fainter than what I could see in the telescope. It is visible in deep images. 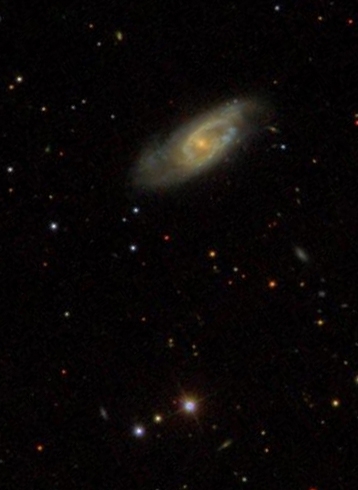 The SDSS (Sloan Digital Sky Survey) photograph of NGC 7393 can be seen to the left made with the 2.5m telescope. 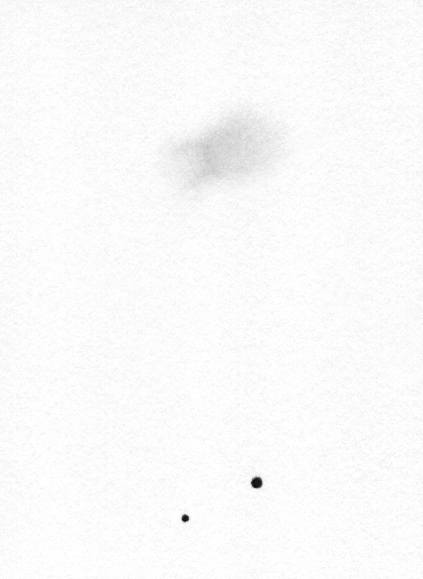 I rotated and cropped the photograph so that it can directly be compared to my inverted drawing.